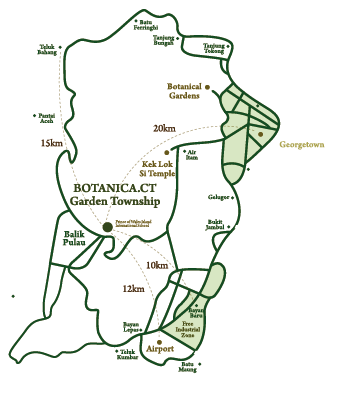 BOTANICA.CT is being developed by MTT Properties & Development Sdn Bhd which was established in year 2005. MTT Properties & Development Sdn Bhd is a subsidiary of Malaysia Trade & Transport Co Sdn Bhd (MTT). Together with all the other subsidiaries, commonly known as MTT-Priority Group of Companies, MTT has a 50-year track record in stevedoring, barging, shipping, total logistics, international freight forwarding, customs brokerage and road transportation. And in 2006, Dato’ Seri Kenny Ong, the Group Executive Chairman established MTT Properties & Development Sdn. Bhd. as part of MTT-Priority Group’s diversification in its business development. Its idyllic location along the banks of Sungai Air Putih in the district of Balik Pulau, situated on the south west region of Penang Island. 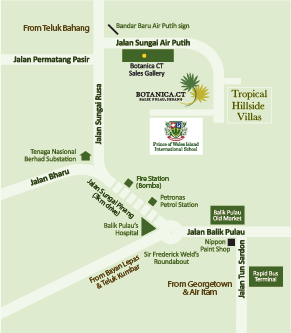 Highly accessible via several expressways, which puts it a mere 17 km from the Penang International Airport and 25 km from Penang’s city centre. located on the northwestern coast of Peninsular Malaysia and comprises of Penang Island and a strip of the mainland known as Seberang Perai. 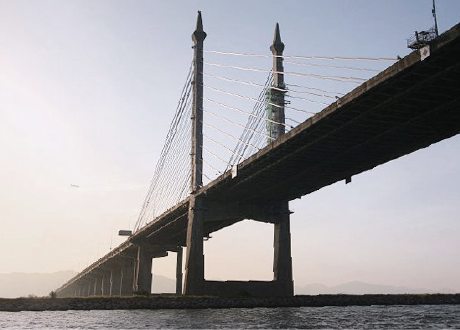 The island is linked to the mainland by the 13.5 km Penang Bridge and an 18-hour ferry service. Originally part of the Malay sultanate of Kedah, Penang was ceded to the British East India Company in 1786 by the Sultan of Kedah to Captain Francis Light, known as the founder of Penang who renamed it Prince of Wales Island. There are approximately 1.4 million residents on Penang Island comprising of ethnic Chinese, Malay and Indians with a sizeable expatriate community. The Peranakan community is another distinctive community more popularly known as Straits Chinese or Baba Nyonyas. The latter are descendants of the Chinese immigrants who settled in the Straits Settlement of Penang, Malacca & Singapore. Penang is filled with exotic religious festivals and tradition throughout the whole year, giving one a chance to experience and witness the beautiful golden beaches, sumptuous cuisine, unique festivals and heritage architecture of the modern era. George Town was listed as a UNESCO World Heritage Site in 2008. Although Malay is the national language, English is also widely used, particularly in business and the tourism industry. As Penang is still a meeting point of many cultures, other languages and dialects are also spoken and understood – these include the various Chinese and Indian dialects, as well as smatterings of Thai and other European languages.